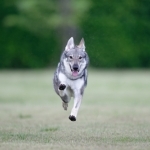 We have had a number of questions sent to us about training approaches with Czechoslovakian Wolfdogs (CSV’s). We thought that we would try to describe one method that we find effective. There are numerous possible approaches to training with the Czechoslovakian Wolfdog, many of these approaches work well with other breeds. The approach we describe is one of several techniques that have been part of our experimental training program with the Czechoslovakian Wolfdog. The approach is not unique to us. It combines components of a training protocol that is utilized with dogs and animals other than dogs. We are having reasonably good success with this approach and thought we would provide a brief description that may be of use to others. The training method involves the use of food as a reward. As most CSV owners learn rather quickly, their wolfdog’s generally have rather high food drive. The CSV does not always have high levels of other drives that are used in training other working breeds. While there are exceptions to this, the food drive has proven to be the most consistent. For a reward to be effective, it must be recognized as a reward. The first step is to create what is often referred to as a Bridge. We use very small pieces of sausage. The reason for this is that the sausage can be consumed quickly without a long distraction to the attention of the dog. Larger food items or items that take a long time to consume will be much less effective as a potential reward. We create the bridge over a period of around 7 to 10 days. It is best to do this when the dog is hungry, i.e. before meal times. The dog is brought to a quiet place with minimal distractions. Training should always be in a venue with minimal distractions, to allow the dog to focus on the exercise at hand. The reward is given along with the attachment of a word or phrase. This verbal cue will serve as the future cue that the dog has done something well and a reward is coming. The use of a clicker in lieu of voice is also fine. We are not going to go into the relative merits of clicker usage in this brief article other than to observe that there is a school of thought believes that the clicker with a consistent sound that does not convey emotion (either positive or negative) is more reliable than a voice. The bridge exercise is done two to three times a day for 3 to 5 minutes. The purpose of this is to condition the dog to the reward protocol. We start this type of training at around 10 to 12 weeks of age. Now that we have a bridge, lets use the example of training a recall of the dog to the owner. The recall exercise is actually pretty simple; we have stretched it out somewhat in order to use it as an example of a training approach to an exercise. The same concept would apply to other types of exercises. We will start with this and then go on to combine this to a retrieve type exercise. We always use a long line with our dogs, the line is around 10 meters long, and it gives us the ability to exert control if we must. We are going to stipulate some time frames for this exercise, they are meant to be indicative only. Some dogs will get the exercise much more quickly, and if this happens there is no need to do a full 5 to 7 days. We are assuming you already have regular contact with your dog through walks and play. We often take our dogs out and play for 5 or 10 minutes before training commences. We want to have a transition from fun to training so that the two become integrated. Starting training immediately with a CSV without play often changes their mind set in a negative direction. It is also imperative that the dog has relieved itself prior to the start of training. If it has not this can really serve as a distraction during training, or cause the dog to appear not to be paying attention. We start with the dog directly in front of us and give the command to come, you may use whatever word is convenient. Keep it to a single clear command. Give the command in a normal but enthusiastic or cheerful tone. In the initial stage for the first day of training we will reward the dog on each use of the command. While the dog is not doing much other than staying in front of us, the dog becomes conditioned to a new command and a reward attached to the command. Depending on the attention span and reaction of the dog, we may do this simple exercise several times over a couple of days. We limit this training exercise initially to no more than 5 minutes per session. This maintains attention and interest, and avoids the CSV getting bored. The second part of the training exercise is to allow the dog to wander a meter or two away, we then command the dog to come. Don’t be disappointed if there is no immediate reaction, patience is required. If the length of the line is limited at this juncture to around 2 meters your dog will eventually approach you. We usually don’t like to repeat commands, as the use of a multiple command often teaches the dog that it doesn’t have to react on the first command. However at what we have referred to as step 2, if some time has passed before the dog approaches, repeat the command when the dog approaches and then reward. This training exercise can be done daily or if there is no apparent boredom twice a day. This stage will continue for around 5 to 7 days. At the end of this period the dog should have developed an association between the command, the desired action and the reward. If the dog is still not coming to you by day 5, then we usually “reel” the dog in on the command and then reward. The dog will quickly get the return association, and you will no longer have to pretend that you are pulling in a fish. Part 3 is really an extension of part 2. Over the next 5 to 7 day period we allow the long line to be around 5 to 6 meters in length. The dog wanders off a bit, or if necessary we walk away from the dog. We then give the recall command and reward upon arrival. If the dog doesn’t recall, or dawdles too much, we “reel” in the line. By the end of the part 3 period the dog will likely be coming back on the recall command with a high degree of consistency. We then allow the dog to go further to the limit of the 10 meter line, and continue recall practice for a couple of additional days. Part 5 begins off leash recall with the dog. This must be done in a confined area where the dog may be able to go as far as 15 meters away from you, but may not leave the area. This is the first time that we do not have the ability to enforce our command be “reeling” in our dog. The dog is allowed to wander off, or we move away. The recall command is then given. If the dog doesn’t immediately respond, do not approach the dog; we are not having the dog “recall” you. Given the confined area, the dog will eventually return to you, repeat the command and reward. For this exercise we will reward on every off leash recall. Over a period of several days you should see your dog improve until the recall is both rapid and consistent. You may continue this type of training, and progressively reduce the food reward. When we have talked about reducing reward in the earlier steps this always refers to the food component, not the verbal component that was learned during the bridge phase. This part of the reward should never be eliminated. Part 6 involves using a larger area, although still with boundaries that the dog cannot leave. At the same time we introduce distractions such as another person, or noises. Over a period of a week or so most dogs learn to ignore distractions and complete the exercise. If necessary with a difficult dog, you can resort to the use of a long line if necessary and then phase it out as the dogs performance improves. At this point we have a functioning recall, so how do we do a retrieve ? Most CSV’s are not natural retrievers. They do not have this type of drive or instinct hard wired in their system. So we must “synthesize” or cause emulation of the desired behavior. Your dog already understands what a bridge is, and it already has a recall. What we want to do now is train the dog to pick up an object, hold the object and let us take the object from the dog. We have broken this part of the final exercise into several parts. Step one is to work in a relatively small area with a ball, stick or other object. When the dog shows interest or touches the object we reward the dog. We do this for several sessions. Step two involves conditioning the dog to pick up the object. We either wait for the dog to pick up the object, or we hand the object to the dog and reward. We continue this phase until the dog picks up the object in return for a reward. Step three involves stretching the time the dog holds the object. If the dog picks up the object and quickly drops it, we cease giving a reward. The dog will generally be confused initially. However over several exercise periods the dog will begin to try different things to obtain the reward. When the dog holds an object for a slightly longer period give the reward. Over a number of sessions the dog will associate the pick up and hold with the reward. Step four involves having the dog release the object to you. When the dog has picked up the object and held it for a time, we approach the dog and with hand extended have the dog release the object to us in return for a reward. We make it obvious to the dog that we have the reward with us, this helps induce a rapid release. At this juncture we will attach a command to the exercise, it can be apport or retrieve. Even though the dog is not yet bringing the object to us. Step 5 involves tossing the object several meters away and giving the command. The dog will ultimately go to the object and pick it up and wait for a reward. When this occurs we can then combine the recall and pickup into a proper retrieve. We do this simply by throwing the object, and doubling our command to retrieve and recall. The dog at this point should go and get the object and bring it back to you for a reward. When this occurs with reasonable consistency, we begin to drop the doubled command, and simply use the retrieve command. The previous description of recall and retrieve is intentionally broken into a protracted number of steps to illustrate the procedure and methodology employed to train a behavior. A great many behaviors can be trained this way. What is important is to think through the desired ultimate behavior and then break the training down into minimal component parts. These component parts are then progressively combined as the dog learns them to create the final exercise. There is a tendency amongst many people to be impatient, or to try and teach a complete exercise to their dog in one shot. This usually results in less than a desired outcome. We often get people who like their dog, feel their dog is smart and that it is not necessary to break training down into smalle steps. We suggest patience, and small steps before big steps. We must emphasize again that the approach we have described is neither the sole effective approach nor will it work on an absolute basis with every CSV. It has however worked well for us with the CSV. Using this approach we have been able to train 7 CSV to the obedience level of IPO BH, 4 to an IPO 1 obedience level, and 4 of them are doing quite well in agility work. Through behavior emulation we have also made good progress in IPO 1 protection training with 4 of our CSV’s. The biggest issue there has been getting them to maintain grip on a protection sleeve, and the bridge system has been showing good results by teaching them to first just grip and hold a sleeve as a reward. This is truly a synthesized behavior and should not be confused with real protection work or aggression drives, which are trend towards the minimal with most though not all of the CSV's we have. We hope this example has been useful. We would be pleased to answer any questions that are forwarded to us.